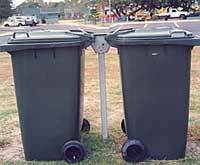 WHEELY BINS ( MGB ) Mobile Garbage Bins (Wheely Bins) are available in three sizes - the dimensions are shown below. Wheely bins are available in a variety of colours (ie: Red, Green, Yellow, Blue, and of course Food grade White at a slightly higher price.) 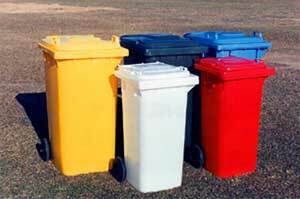 Wheely bins are supplied pre assembled or stacked as needed. 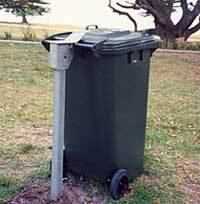 Where a large litter container which is to be cleared by a domestic refuse truck is desired, a 120 or 240 litre mobile garbage bin may be used. In such a case it is desirable to secure the wheely bin to prevent theft or re-location at the same time allowing access by the contractor to empty the bin quickly and easily. The LockingPost provides the answer. Designed for all brands and types of MGB's, it features a fully stainless steel , key-operated lock and a bin lid opening restraint bar to prevent dumping of large quantities of household garbage. The push to shut feature allows the contractor to replace the bin quickly. Locking Posts are supplied ready to be installed, please specify bolt down or concrete in configuration at time of order.